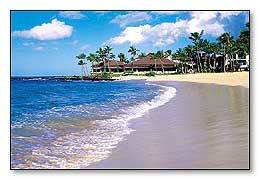 Outrigger Kiahuna Plantation is situated on 35 acres of lush gardens and sits on the oceanfront of Poipu Beach. 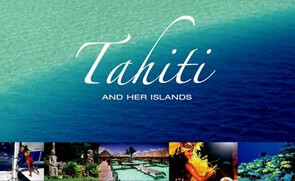 Spacious 1 and 2 bedroom condominiums offer convenience in a tropical setting complimented by gracious hospitality. 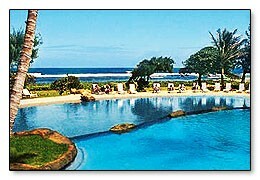 Our ultimate “Hawaiian Classic” Kauai resort is ready to transport you back in time to the Kauai of the 1920s and 30s. Challenge yourself on the standout of championship Kauai golf courses. Vacation or convention, the Kauai resort has earned its place in the sun by virtue of its sheer beauty and unprecedented commitment to excellence in service. 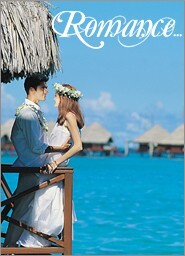 Experience the Hawaii you’ve always dreamed of. 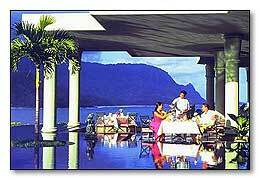 One of the best of Kauai hotels can make your dreams come true. Enjoy oceanfront allure as you relax in comfortable tropical plantation style surroundings. Great central location, close to incredible sightseeing, exciting activities, shopping, dining and great golf! There is a three-mile strolling beach. 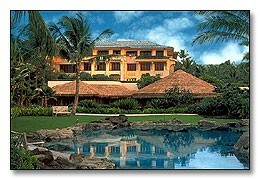 Grotto with waterfalls, water slide, two whirlpool spas, four pools including the ocean-side sand bottom pool. Nightly Manager’s cocktail hour followed by torch lighting ceremony and Polynesian dance show. Excellent dining at very affordable prices. Poolside bar and grill. Internet Cafe. Wonderful Aloha guest service. Centrally located on the island. You can spend your time relaxing and being pampered or enjoy activities such as, golf, watersports, swimming, massage, therapy, dining and lots more. Hotel consists of 10 floors with 345 rooms including 11 suites. 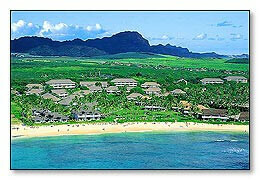 Located on the sunny southern coast of Kauai, centered around the crescent-shaped, white sand Poipu beach. Four stories high with 3 well appointed wings, 2 outdoor swimming pools, tennis courts, fitness center, massage center, beauty salon, sports bar and restaurants. This isn’t just any resort on any island. 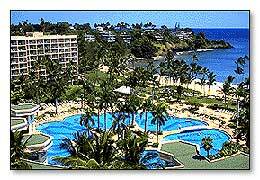 This is the Princeville Resort, set gracefully on 23 acres on Pu’u Poa Ridge, and terraced along the bluff facing Hanalei Bay. Choose from one of 252 impeccably appointed rooms and suites, all boasting spectacular views of the Pacific Ocean, Hanalei Bay and the Na Molokama Mountains. With lush landscaping and brilliant tropical flowers in abundance, the Princeville Resort is dazzling in its natural beauty.